I went back and forth with being disgusted by the storyline and riveted at the same time. Yes, it was a weird experience. 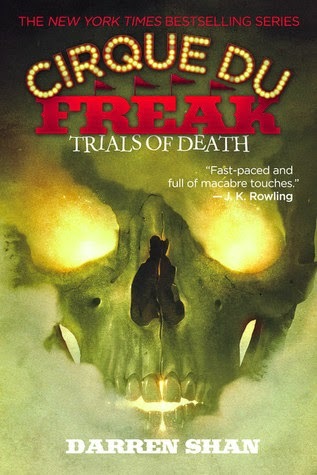 ‘Trials of Death’ wasn’t filler-ish, better than the fourth because the pacing and almost non-stop action made it hard to put down. Action scenes were excellent, nail-grinding, detailed, spaced right. Some disturbing stuff happened during the trails, especially the weird flame stuff. Characters are more fleshed out, seeming livelier and not imitations of their former selves (the fourth suffered from that a little, especially for Crepsley.) Arra is still irritating, as are a lot of the princes and other vampires following their rigid systems without the bend of common-sense exceptions. There is something that soured it for me – I still think Darren shouldn’t do the trails because of his age and half-vampire status. Letting a child go through all that, especially for some ancient and limited system, was a form of child abuse and that sickened me. Yes, it’s fiction, but still wrong in this fiction world. There were a lot of torturous trials – burning, almost drowning, cutting, fighting to the death with wild boars – shudders. The burning was the hardest to take because of the detail. His hair will likely never grow back because of the permanent damage. I mean, geez. All this for that silly code? Crepsley’s outlook and rigid adherence was disappointing. Apparently I’m more protective of the protagonist that his mentor was. It’s shown that these bizarre mindsets are how these strange creatures thing. I agreed with the one outcast of the group that there is no honor in losing your life so willingly. If I were in Darren’s shoes I would have started getting angered and feeling betrayed. The ending holds a nice surprising or so, and although I did see a betrayal brewing, it worked well for ending this book. Even if I guessed a little of it, it leaves it open with no predictable start of how the next book will begin. Despite my annoyances with the plot’s direction, it stayed exciting and earned a four star label. “The hands of Fate keep time on a heart-shaped watch."